They arrived.safely and...in double quick time. (within 24hrs of placing the order).. They look eminently suitable ...and they all had a resting voltage of 12.7.....However....with batteries...only time will tell. The last ones (not this make) have given almost 10 years of faultless performance. ...and I`m hoping that these will be very similar.....We will see. This battery is well made and is just what I needed in terms of spec. It was also delivered promptly so I am very satisfied with the service. Super fast delivery. Battery looks like quality product, should be from excide, ask me again in 5 years. 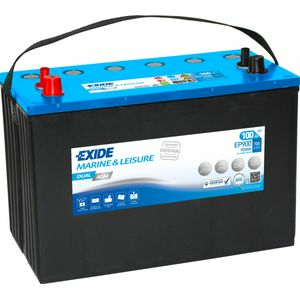 The Exide DUAL AGM battery is designed for both starting your engine, and supplying power to your other electrical equipment.